Accommodation: Gloria Hotel offers 3 single and 117 double rooms. 67 The rooms are completely renovated, with their own WC and balconies, lounges, and view out to the park, telephone, possibility for placing an extra bed in each room, refrigerator and TV-set with cable television. - tourist office offering various excursions, animation and cultural programs, guides – interpreters, provision of transportation services according to your request and choice. 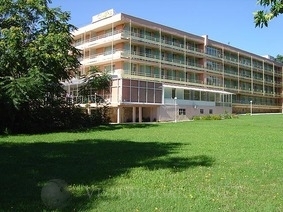 - room service, safe at the reception desk, laundry and ironing are also available.